16 Mar 2019 Silent Update * version number fix. v12.3.2019 * fix reading 16-bit files. v30.10.2018 Beta + Ctrl-Left è Ctrl-Right open previous/next file; + opened file name in status bar in Quick view. v14.6.2018 + Dutch translation; * some internal changes. v6.6.2018 + delete/re-arrange icons in multiicon. v28.5.2017 * fixed localizations work with different encodings; * fixed memory leak when view 16-bit icl files. v21.2.2017 * for tablets popup menu added for status bar; + German translation; * Danish translation updated. v10.2.2017 * public version. v7.1.2017 Preview + keys in setup file for draw text shadow in main window: "MainDrawTextShadow=1" and "MainDrawTextShadowQView=1"; * thumbnails antialiasing option will saved now; + Danish translation; * some internal changes. v27.12.2016 Preview + keys in setup file for draw text shadow in thumbnails mode: "ThumbDrawTextShadow=1" and "ThumbDrawTextShadowQView=1"; * some internal changes. v9.12.2016 Preview + Language select in Setup dialog; * changes and improvements. v19.11.2016 Preview * fix draw 1 bit non proportional icons; * fix save 1 bit icons to png; + new thumbnail sizes: (380x380, 512x512, user defined); + key in setup file for user defined thumbnail size: "ThumbSizeCustom=160"; + maximize Lister window when plugin starts option added to Setup dialog; + key in setup file for Language: "LanguageFile"; + key in setup file for antialiasing thumbnails: "ThumbAntialiasing" - only if icon size greater than thumbnail size, with cache; * some internal changes. v25.8.2016 * when save to 32-bit ICL icons start named from 1 now. v23.5.2016 + single icon sorting (changed in Setup dialog); + thumbnails text switch off key in setup file "ThumbDrawText", default 1; * changes in search function; * some internal changes. v28.1.2016 * pluginst.fix fix (silent update). v9.1.2016 * version number fix (silent update). v8.1.2016 * icon to png save fixed (in 64-bit version); * some internal changes. v23.9.2013 + open files with long names (256+, only if 8.3 aliases enabled); * some internal changes. v26.8.2013 * DetectString is changed: MULTIMEDIA & (ext="DLL" | ext="EXE" | ext="ICL" | ext="ICL32" | ext="ICO" | size=0 | force) (reinstall plugin needed); * TC thumbnails proportions fixed; * speed up TC thumbnail show in some cases; * show real file bits (64 bit/32 bit/16 bit); * some changes and improvements. v29.1.2013 + Unicode filename support; + Windows x64 support; + show icons for big exe and associated folder icons in TC Thumbnail View mode (ThumbnailsInTC=1 in ini); + ability to change background icon colors (Setup... menu item); * some changes and improvements. v21.8.2009 * Delphi virus fix; + save to 32bit icl files; + show library is 32 or 16 bit in status bar; * height of status bar fix. 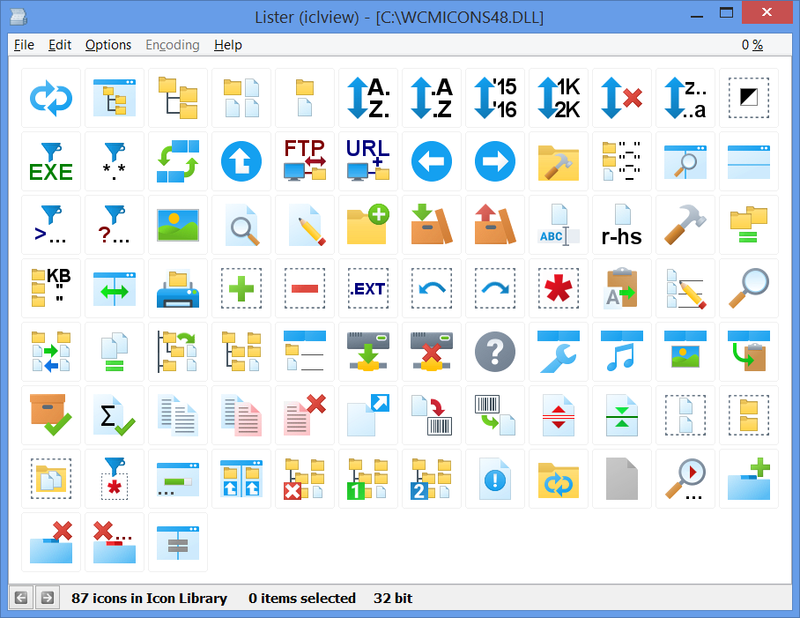 v5.5.2009 + view 16bit icl files in Vista (and possible in Windows 7); * fix many icons draw corruptions. v3.10.2006 + new menu item "View Icon..."; + full support of icon transparency and alpha channel when save to PNG. v26.6.2006 * improved draw 1bit icons in thumbnail mode; * changed back arrow draw of non-selected items (don't draw it). v22.4.2006 + view mode is stored now; + new thumbnails view options: draw border, draw icon in center of thumb; + select thumbnails view sizes: (32x32, 48x48, 96x96 etc. ); + separetely thumbnails sizes and view mode save for Quick View and Normal view modes; + key for plugin setup file "StartMaximized" for maximize Lister window when plugin starts; + Select Duplicates function for lib's (compares icons by content and select dup's, ex. if 2 same icons in lib then second of it only will be selected); * default View mode for Quick View is thumbnails; * thumbnails draw improvements; * BPP for compressed icons correctly showed; * some changes and improvements. v28.3.2006 Beta * max item height is 255 pixels now for best view big (256 x 256) icons; + search icons by name in libraries; + horisontal scroll bar for big or many icons (note: some draw errors for selected icons); + png-compressed icons support; + new view mode for libraries; + buttons for view next/previous same type files in directory; * some changes. v25.9.2005 * improved sort order of big icons (Win XP only); * fix next plugin window focus losing (when button 4 pressed); * some internal changes. 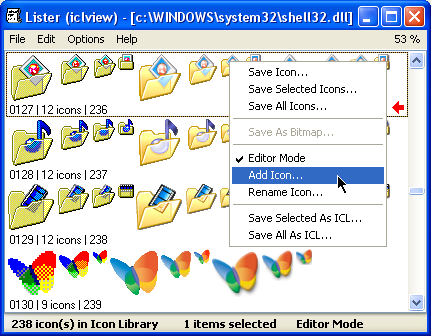 v4.6.2005 * fixed automatic rename (manual renaming lost) icons in ICL files when saving; * improved support of big icons (Win XP only); * DetectString changed to 'MULTIMEDIA & ext="ICL" | ext="ICO" | force'; * some internal changes. v18.4.2005 - hints removed; + Editor mode: + renaming icons in libraries; + adding icons to libraries; + rearranging icons in libraries dragging by mouse; * some internal changes. v16.4.2005 * fixed "Out of rersources" bug; + new file types added: scr, ocx, bpl, wlx, wfx, wcx, wdx, cpl, acm; * some internal changes. v28.1.2005 + hint about sizes and bpp icons in lib; * when save icon from lib by default filename will be set to "number - name.ico"; * some internal changes. v9.1.2005 + view *.ico files in TC 6 or later; + saving single icons to *.bmp (bpp sets by default! ); + deleting icons from *.icl files by Del button pressing; + all icons may be saved as *.icl; * some internal changes.